Hard day for Mr. Policeman. Okay, so I said I had a top 10 list of things I wish I had known and I did have a top ten list of things. But, through the process of writing up and thinking about those top ten things, I happened to come across 5 more things I wish I had known before I moved to Japan. Drinking is a big part of Japanese culture. And in the big cities like Tokyo, Osaka, etc… you basically get everywhere by train. These trains are really convenient. They usually run pretty close to on time all the time, are pretty clean, and have generally friendly polite people on them. The only problem with these wonderful trains is that they all stop around midnight. There are some rare exceptions to this rule, but generally speaking if you are out somewhere after midnight, you will probably be staying there until the first train, which is around 5 or 6 in the morning. And, those 5 or so little hours seem like not that long when you are drunk and having fun, but for some reason, at around 2 or 3 in the morning (or earlier) your body begins to strongly crave a warm bed somewhere. You could try a business hotel, which are fairly cheap (Y4000~Y6000/night) or the more adventurous option of a love hotel (Y6000~Y9000/night), but what if you don’t have that kind of yen? Well, there are all night Internet cafes that you can go to. These cafes usually have some kind of night pack for about Y1500 or so. And with that, they usually include some drinks, a computer of course, sometimes a shower and some cheap curry. They can be an excellent place to waste away the time until the trains start up again. Any major train station will have at least one cafe within a 5 minute walking distance. Living in the big city, you are surrounded by thousands of people swarming around you. That massive group of people will inevitably be packing a lot of germs and viruses with them. Also, with a different country, comes a whole new set of different kinds of germs and other goodies that your system is not used to fighting off. Although I’ve seen some YouTube rants about how Japan is trying to kill them, I think it is more a combination of lots of people and lots of stress from living in a foreign country combine to make you more susceptible to diseases. I personally have gotten the flu twice, and I never got it back in the States. I used to get at least two colds a year when I first got here too. So, remember to eat right and be a little particular about keeping your hands clean. There is a Japanese custom to always wash your hands and gargle with some kind of mouthwash when you get home. This is great advice if you can keep up the habit, but in general just keep your hands clean, eat right, and sleep right and you should be okay. 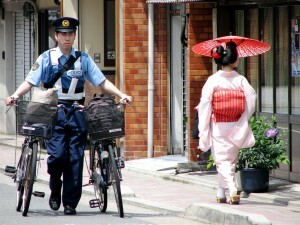 There is a common conception that Japan is a relatively crime free place. And this notion generally holds up. I heard one statistic from the Aichi World Expo that there were only 4 reports of pickpocketing at an event that drew over 12 million people. And they said that some of those might have been people misplacing their wallets. So, generally speaking, you don’t really have to be on the look out for scams or tricks pulled on tourists that tend to happen in other countries. But, you do have to protect two things: bicycles and umbrellas. Bicycles, for whatever reason, tend to get stolen a lot, especially in a big city. There aren’t exactly organized crime rings stealing them or anything like that. I’ve heard the typical culprit is a drunk businessman (or woman) that missed last train and just wants to get home. Whatever the case, there is a bike registration system to help prevent bike theft. If you buy a bike in Japan, you will have to pay a small fee to register it. This also means if someone gives you a bike (e.g. because they are returning to their home country) you should register it or you might get busted for having a bike not registered to you. Although I have had a few bikes given to me and I haven’t re-registered any of them. So far so good, but I wouldn’t recommend it. Umbrellas are another thing that gets stolen a lot. Often times you will see an umbrella stand at the entrance to a store. If you leave a good umbrella (one that costs more than Y500), it might walk off while you are doing your shopping. Cheapy umbrellas are immune of course, but if you have a nicer umbrella and it’s raining, you should probably keep it with you. A lot of nicer places will offer stands that have plastic umbrella bags that you can stuff your umbrella into to keep it from dripping all over the place as you carry it with you. When I first came to Japan, I would sometimes notice these strange shops with large kanji-filled signs. The only thing I could read at first was AV and DVD. Of course, I thought it was a little strange for an electronics store to cover up all its windows, but I thought it was just a Japanese thing. I found out much later, that AV actually means adult video, and that those strange stores with big signs and covered up windows were actually adult video stores. Although that might be your thing to go check out, if it isn’t your thing, you might want to steer clear of those mysterious shops. You might think you know Japan, and you probably do. If you are reading this blog, you know about the JLPT, and have probably been studying Japanese for at least a couple of months. Or at least, if I was a betting man, that is what I would bet on. And as such you have probably read a little about the culture. Or you have read news stories about Japan here and there. You might have watched a few animated TV shows from Japan, knowingly or not. But, those are all just fragments of the big picture that is Japanese culture. I’ve met more than one person that has come to Japan with fairly strong preconceptions of what Japan is like. These are usually very positive preconceptions mind you, nothing racist or out of the ordinary really. But what you will experience in Japan will be unique to you. It will be a personal snapshot that you take that will be nothing like anyone else’s snapshot. If you choose to live in Japan for any length of time, you will gather an experience that is unlike anything you expected, which is why it is one of the best things you can do. And it is why people that come to Japan with strong expectations of what it will be like tend to not last long. I’ve known a few people to go home after just a year or even a few months, when they were planning on staying much longer. I would almost go so far as to say don’t read anything about Japan before you move here, but that is a little extreme. Just gather snapshots from several sources and realize that your snapshot, if you choose to come here, might be similar, but definitely not identical. Is there some advice you would give to someone thinking about moving to Japan? Tell us about it in the comments. I laughed, because it’s true. I’ve only ever lost three things permanently in Japan – my umbrella, my bike, and my DS. And like the Aichi World Expo statistic suggests, it’s probably still in the only lost and found box in Nagoya that I didn’t check. I even lost my spare car key soon after I moved to Hokkaido. It turned up over a year later, left on top of my trash box…still scratching my head over that one. Haha, I can see that though. Somebody finally tracked it down and returned it to you. That’s so Japan. I also like how people will put things up on a fence or in a tree if they find it on the ground so other people can find it. So thoughtful. So, its not like most people steals things. It sounds like they “borrow” them in the rush of the moment, for necessity. It sound really innocent to me. It’s all in how you look at it I suppose. But, I have never gotten back an umbrella that someone ‘borrowed’, but it all works out in the end, doesn’t it? I’m commenting on episode 113 here (10 things part 2) because it seems to be missing from the list of entries. I’ve been seeing moths around my apartment over the last few weeks and it just so happened that it was the first thing you talked about in episode 113. I quickly checked my rice but unfortunately, there were no moths. Meaning, I still don’t know where they are coming from.. I will keep looking. As for ‘seeing’ Tokyo, I live here. I’ve also traveled quite a bit. When traveling, I try not to spend more than 3 days in any city as cities are generally a bit boring for my taste and too fast paced for a short trip (living in one is another matter: to absorb nuance). My taste is doing, not seeing; after living in Korea and Japan, and traveling Southeast Asia, I couldn’t care to see another temple! My recommendation, which is only natural, is to do whatever your hobby is when traveling. Eg. if you like hiking, go hiking here. If you like Japanese history, visit the temples and castles, if JPOP, see JPOP. In terms of aimless travel, check out the Shibuya intersection, Tokyo Tower or Skytree, Robot Restaurant, Odaiba, Tsukiji (before it’s moved for the Olympics), and perhaps a Sumo match. This as you said, could be done in a couple of days. Food, as you mentioned, is great here. Pick any ethnicity food and it’s better than the corresponding restaurant in my country (shall remain nameless!). But this is Japan, everything is higher quality than ‘the West,’ like dollar store plastic products. We recently just found moths taking up residence in our chili powder! Who knew that they would even find that remotely inhabitable, but they somehow managed to sneak in under the cap and create a little nest on top of the powder in a small little spice jar. My latest mystery involving insects though is how in the world we got not one but two huntsman spiders in our house. Those suckers are the size of a big sand dollar and incredibly fast (they ‘hunt’ cockroaches hence their name). Absolutely freaky, and I still have no idea how they got in, maybe through the ventilation? Next post: Does one Word make someone Fluent?